Fr. John Romanides was born to pious parents from Cappadocia in Asia Minor, who during the population exchange of 1922 went to Piraeus, where he was born on 2 March 1927. When he was 72 days old, on 15 May 1927, he emigrated with his parents to America, where they settled in Manhattan. There his father Savvas worked as a tailor and his mother Eulambia was a housewife who helped her husband. Fr. John also had a sister named Parthenia, and in the house they spoke Turkish instead of Greek, since in Cappadocia the Greeks spoke Turkish. Eulambia however was also an ascetic living in the midst of the city, for she brought with her the Cappadocian piety she learned in her homeland. This ascetic mentality was also taught to her son, who would later recall her saying to him as a child: "My child, one does not become a saint by force. It is something you must want!" When he explained these words of his mother, he wrote: "Of course someone cannot become a saint by force, but each of us must choose the path of ascetic therapy." Especially noteworthy was her constant prayers while she did anything. She was a woman of noetic prayer, with the name of Jesus always on her lips. And often with these prayers she would do prostrations...many prostrations. When John was a boy he would notice his mother doing numerous prostrations, and being the jokester that he was, he said to her one day: "Mom, why are you doing one prostration after another?" And she responded to him: "Joke on, little John, joke on! Know that you will become a priest." This showed that she possessed a prophetic and clairvoyant gift, despite being a married mother in the largest city of America. A year ago I visited this monastery, and the current abbess of the monastery, Philothea, told me: "This grandmother (Eulambia) did not know Greek very well, but she was the first at Services, the first in obedience, and she had a great clairvoyant gift. For example, Elder Paisios would sometimes do his prayer rule from bed. Grandmother Eulambia from Souroti in Thessaloniki would see him with the eyes of her heart - not with her physical eyes - what he was doing in his cell. When they would meet later on, she would tell him: 'On such and such day you were sick, Elder, and you didn't do all of your prostrations, nor did you do all of your prayer rope.' He replied: "You saw me when I was on the Holy Mountain?' She answered: 'Yes, I have a television that showed me.' 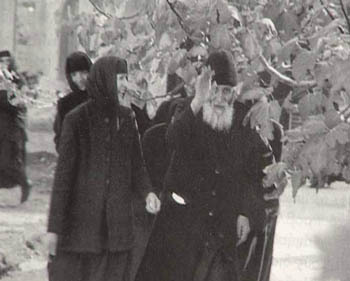 Saint Paisios then said in amazement: 'Would you look at that, this grandmother who came from Turkey and America also has a colored spiritual television and follows what I do on the Holy Mountain!' All the nuns were astonished by the gifts of grandmother Eulambia."